Are you ready for the 2019 World Series of Poker? If so, we now know most of the schedule for the 2019 WSOP. According to a release on WSOP.com on Wednesday, there are now 73 event schedules now online. Also, officials have announced some big changes that will have a massive impact on the future of the series. First, many of the events will have “significant increases” in starting stack size. Also, dealers don’t have to worry about collecting antes from players anymore as now the Big Blind Ante will be featured on all tournaments. On Wednesday, WSOP officials released the schedule of 34 additional bracelet events for the 2019 WSOP, bringing the total number of events released to 74. As expected, the majority of events released on Wednesday were staple events with many of the non-Hold’em events now listed on the schedule. There are a couple of new events on the schedule, with the first being a “Bracelet Winner’s Only” event on July 10th. The event will feature a $1,500 buy-in and only those that have previously won a WSOP bracelet can participate. Up until this year, there have been 1,078 bracelet awarded and 60 additional bracelets will be awarded before the start of this tournament. This event will crown the “champion of champions” and should produce an interesting final table. Will we see a superstar final or one composed of lesser known bracelet winners. Back in the day, a WSOP starting stack was equivalent to your buy-in. Back in 2006, I bought into the $1,500 Limit Hold’em event and got 1,500 in chips. Of course, the blinds were very slow and it worked but many still viewed this as a crapshoot setup. Over the years, starting stacks have grown and once again, they will grow in 2019. According to the press release on WSOP.com, most events will see a dramatic increase in starting stack. The prime example is the $1,500 NL Events that will see a stack increase from 7,500 to 25,000. One of the only events that won’t see an increase is the $2,620 Marathon Event that already has a starting stack of 26,200. Of course, the structures will be changed to keep pace with the new chip stacks. In some cases, certain events may see additional days added to the schedule. Another major announcement in the press release is that all NL Hold’em events will now feature a Big Blind Ante format. The old school method of posting your ante will be replaced with the single ante from the big blind. This change is not just for bracelet events, but all tournaments held at the World Series of Poker. This is to be uniform and to keep up with the changing times. There are many live events using the Big Blind Ante format, especially in higher stakes tournaments. The WSOP tested the Big Blind Ante in select events last year and it proved popular. It will also make things remarkably easier for the dealers and should speed up the game. 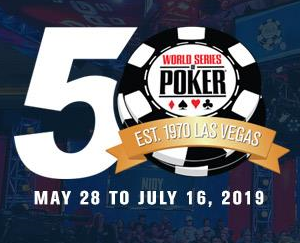 While the majority of the 2019 WSOP schedule is out there, there are still a few more events to add, specifically the online events at WSOP.com. Assuming that the recent changes in the federal Wire Act doesn’t force the WSOP to cancel online events, we should see those events added once the final schedule is released in the next few weeks.